Gardening: A gay gazebo for your garden? A gazebo for your gay garden? In Victorian times, a garden gazebo was a place for the ladies to retreat from the sun so as not to mar their perfect, porcelain skin. Today, gazebos can be used in a multitude of ways and can be designed to fit into any landscape. If you are thinking of adding a gazebo to your garden, there are some basic questions you will need to consider. What function will your gazebo serve? Gazebos can be used as a quiet place to read or relax. They can also be used as a place for your children to play, or for large, relaxed outdoor gatherings. An idea that is becoming increasingly popular is to build a gazebo over a hot tub for shade and privacy. The way you will use your gazebo may help determine other factors, such as size and style. Visit spasandthings.co.uk for a full range of portable wooden and metal garden gazebo enclosures and surrounds for UK hot tubs. What type of material would you like for your gazebo? Today’s gazebos can be made from a large variety of building materials. Most of these fall into three categories: wood, metal or vinyl. Historically, gazebos have been made from wood, so if you’re a traditionalist, this may be the way to go. Wood requires a bit more maintenance than metal or fibreglass; it needs to be stained or painted regularly to prevent weather damage. 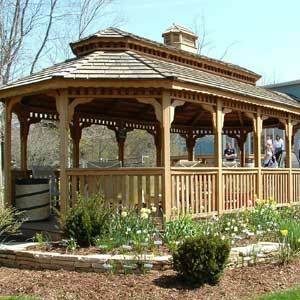 There are many types of wood that are appropriate for building a gazebo. Teak is a very hard, very durable wood that weathers to a beautiful silvery-grey colour over time. It is the most expensive of the woods that are commonly used for outdoor furniture, but also the most resistant to warping and rotting. Cedar is also very long-lasting. If you want to maintain the unique red-brown colour for which cedar is known, you’ll need to apply a clear sealant every two or three years, otherwise it too will become light grey. If you want to paint your gazebo, the best wood to use is pressure-treated pine, as it will absorb paint much more easily than either teak or cedar. Metal gazebos are usually made of wrought iron, although steel and aluminium can also be used. Wrought iron gazebos usually have a powder-coated aluminium finish. These finishes come in a variety of colours, so you can have a wrought iron gazebo in almost any shade imaginable. Most steel and aluminium gazebos have a metal frame, but the roof and possibly the sides are made of a weather-resistant fabric. Vinyl gazebos are usually the least expensive and also have the advantage of being nearly maintenance-free. They weigh much less, so many vinyl gazebos are even portable. The major disadvantages are that you may not like the artificial look of vinyl, and it won’t last as long as wood or metal. How big will your gazebo be? The way that you plan to use your gazebo will be a major determining factor here. If you simply want a quiet place to relax, a gazebo that’s about six or eight feet in diameter may be big enough. If you want to host outdoor parties in your gazebo, you will want one that is at least 16 feet across. Remember, if you are going to build the gazebo for a hot tub, make sure that you get one that will enclose the tub and leave enough room to walk all the way around. Will you build the gazebo yourself, order a kit, or have it custom-made? Unless you are a carpenter, you should stick with a simple plan if you’re building the gazebo yourself. However, there are lots of kits out there that can make even a self-built gazebo look as if it was custom-made. In addition, you can add nearly any option imaginable to a kit, such as electricity or benches. Would you like your gazebo to be open or screened? There are gazebos with permanent screens, windows and doors that can be used year-round. If you’ll only use your gazebo during the warmer months, you can also leave it open. If you just can’t decide, you can even get a gazebo with removable screens. Remember, it may be necessary to get a building permit to install a gazebo, especially if it is a permanent structure or includes electricity and/or plumbing. Gazebosgalore.co.uk sell Easi-Fold gazebos and ajmshopping.co.uk have an extensive range of elegant gazebo, marquee and garden pavilions, including wooden, wrought iron, metal, canvas, pop up and folding gazebos.